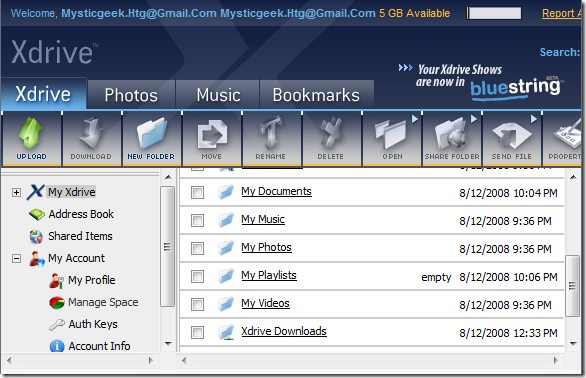 So far we have taken a look at SkyDrive, Mozy, and ADrive for backup, storage, and sharing your data. Another popular option is AOL’s Xdrive. Like Microsoft’s SkyDrive you get 5GB of storage with Xdrive. Uploading files to the Xdrive is pretty straight forward. Click on Upload from the Xdrive menu interface. Shown here is the classic interface of the Xdrive. A separate window will open for your download. Accelerated Plus is an enhanced feature as i allows you to upload multiple files. Basic you only upload on file at a time. You will get a progress bar and a message advising you if the transfer was successful or not. That is all we need to look at for the old interface. Since we are technology geek’s it is important to check out the latest / greatest features. The latest feature to check out here is Xdrive Desktop Lite. This is still in Beta but it seems to offer a lot of coolness already, it uses Adobe AIR technology and makes transferring files easier. You will be required to install Adobe AIR 1.1 to use Xdrive Desktop Lite. The installation is pretty quick and painless. 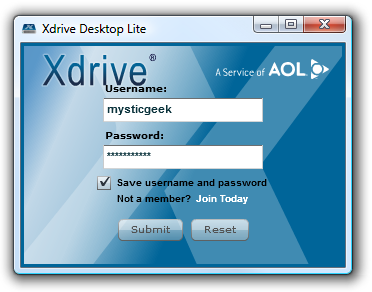 To begin using the Xdrive Desktop Lite application the first thing to do is log in to your account. The Xdrive Desktop Lite user Interface is slick and and easy to use. Just launch the Desktop Lite and drag and drop your files into the directory you want to save it in. Sharing your files with others directly from the interface is a snap. Just pick out the file you want to share and send it off. You can easily pick out contacts from your AOL address book. You can also administer permissions for the folders and files you are sharing from this screen. You can also schedule automated backups by downloading Xdrive desktop (not the Lite version we just covered). After first installing Xdrive Desktop you are prompted to set up Auto Copy. This will monitor and sync the folders you choose when changes occur. 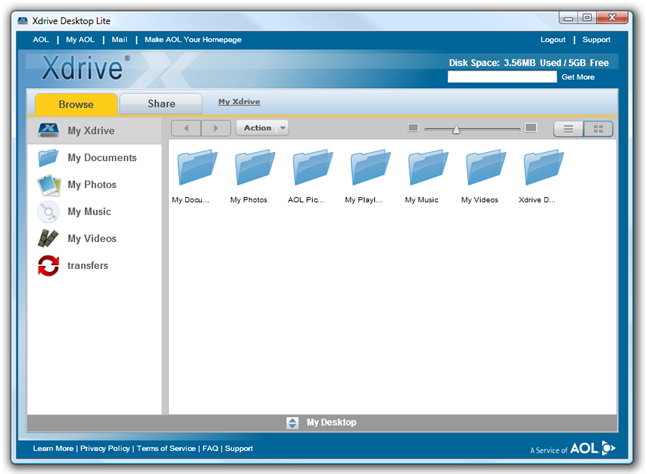 The user interface of Xdrive is quite intuitive as is managing your files online. The free account is for 5GB of storage with the file size only limited to the amount of space on the drive.